Realm of Terror Haunted House is a Haunted Attraction located in Round Lake Beach, IL. 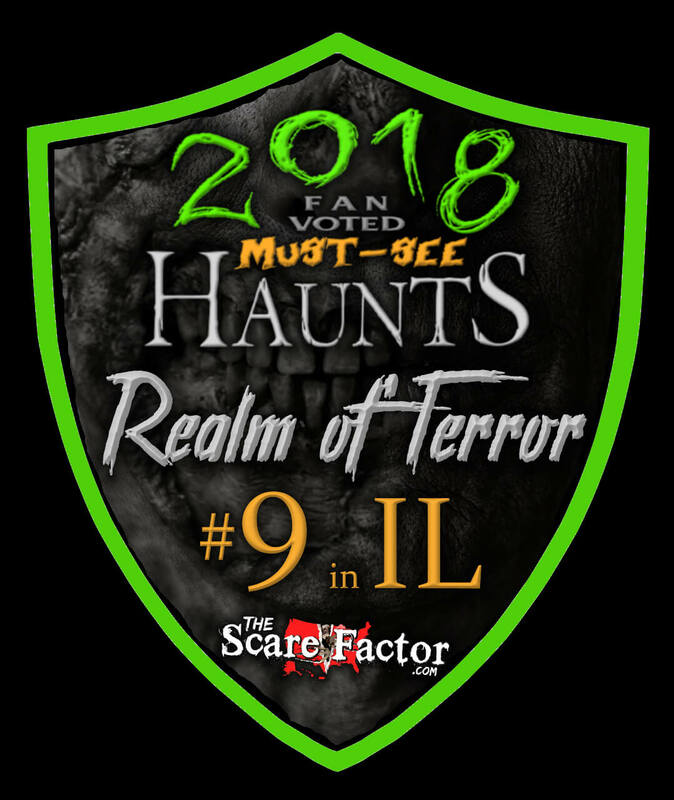 Slightly off the beaten path located in Round Lake, Illinois, somewhere in between Chicago and Milwaukee lies one of the scariest haunted attractions this review team has ever encountered. Now in its 15th season, Realm of Terror Haunted House is a teen/adult-oriented gore-filled haunt with an intensity level you are not likely to soon forget! With a marvelous cast who are allowed to touch their victims, highly detailed sets, and an original, highly creative storyline, this is one of the “Must See Haunts” in the area. RoT has a cast of around 60 different characters on any given night which seemed to fill the haunt quite well. The cast here is known as “the family” and it was apparent to us that the actors are quite committed to their roles showing a lot of enthusiasm in their performance. They were an absolutely relentless bunch that attacked from everywhere, even above and below us! We didn’t come across a single actor who broke character, even when we tried to throw them off of their game by speaking to them. Overall we felt that each member of the cast fulfilled their role admirably with the entire cast being quite believable, working well with their respective scenes and displaying excellent timing with their scares. While there were many fine performances during our visit, we would like to give a special “shout out” to the zombie character who referred to himself as “Dad.” We had the pleasure of interacting with him for an extended amount of time first during our wait to enter the attraction and then afterward before heading to the car. He was equal amounts of, funny and frightening with his crude jokes and bizarre antics. He had us laughing one minute and gasping the next, it was like going on a scare-actor roller coaster ride! We won’t give away any of the surprises but we will say that “Dad” gave one of the top three actor performances of the entire 2017 season. RoT had a wonderful cast this season and along with “fright effect” was our favorite element of the haunt. We found the costuming, as a whole, to be quite original, creative and well-designed. The majority of the characters had a very menacing, gruesome and utterly creepy look with well-applied blood, open wounds, and grime. The makeup was very well done, with the gore effects in particular looking as authentic as any we have ever seen before. We noticed elaborate touches like colored contact lenses, detailed applications, the use of prosthetics, professional quality masks, and attire that appeared to be custom made for their characters. Overall the costuming looked complete, believable, and appropriate for their character’s role. RoT’s location at the Kristof’s Entertainment center is fairly easy to find, though we got confused as to where the parking was and ended up parking on a side street a few blocks away. There is however ample free parking in the lot on the west side of the property, with spotters helping direct traffic. On-site there are plenty of public restrooms, concessions, a gift shop with cool RoT swag and best of all a full cash bar for those 21 and up. As an added bonus the indoor waiting is great for cold or rainy nights. We found the staff to be very helpful, friendly and they really went the extra mile to make our visit enjoyable. RoT is located at a family amusement center, so the outdoor atmosphere does suffer just a bit. However, RoT does a good job of setting the mood with loud heavy music playing, colorful lighting, RoT signage and some cool skeleton props near the entrance. The queue line actors did a great job of keeping the crowd entertained and the creepy soundscapes coming from inside the attraction itself got us pretty pumped up for our journey that lay ahead. Let us start by saying that we do not recommend RoT to anyone with a weak stomach. The amount of gore here rivals any we have seen outside of the Haunted Hoochie in Ohio. Dead bodies, body parts, and lots and lots of blood filled many of the scenes throughout the attraction. The sets were nicely detailed with a high level of authenticity. Our favorite scenes included the medical facilities, the junkyard with abandoned cars and a unique flickering light maze that was pretty much the entire second half of the attraction. The sound effects throughout the entirety of the attraction were outstanding with lots of sudden, loud noises that really caught us off guard. We must give special mention to the sounds as they were some of the most creative we have ever heard. The soundtrack during the final leg was especially creepy and highly original and we promise you’ll never think of the “number 9” quite the same again… those who’ve made it through will know just what we mean. While the lighting as a whole was very well done, we felt there were a few scenes that would have benefited from additional or more dramatic lighting so that we could see all of the details more easily. Guests of RoT are brought to a place to take part in a sacrificial ritual to serve the Gods of a bizarre cult, known as “the family.” You must survive this ritual to be inducted into the family, or risk being sacrificed like the many others found tortured throughout the families’ lair. From the opening “baptism” scene it was apparent to us that RoT puts a lot of thought and effort into their theme. We came across many “guests” who apparently didn’t have what it takes to survive the cult’s ritual as evidence by their remains were strewn around throughout the attraction. To give away any more would ruin some of the surprises that await you. We felt the theme was very well executed and found the majority of the sets, script, character roles, and costuming fell in-line with the overall backstory. 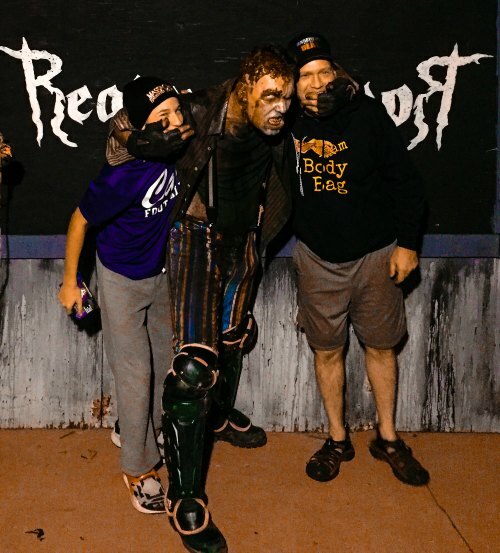 RoT did one thing better than most of the haunts that we visited in 2017 and that was “scare the sh*t out of us!” In fact, they scored in our top 3 for Fright Effect out of all of the attractions we visited in 2017. As mentioned earlier you should be aware that the actors are allowed to touch you, something that the majority of attractions aren’t willing to commit to. 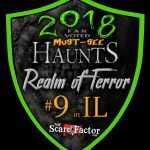 We aren’t aware of any other haunted attraction in the greater Chicago and Milwaukee areas that does this, which makes the tour through RoT quite unique and scarier than most. The touching was in no way inappropriate nor did it ever get to the point of being “extremem” as we were never manhandled or touched aggressively. Without giving anything away, we found the “touching” element added greatly to the fear element during our tour. RoT excels at getting the customer out of their comfort zone with its tight spaces, lots of ducking, bending, and navigating around set pieces in order to get through the different rooms. It was in those moments when our focus was completely on maneuvering through the scene when we were hit with the best scares of the tour. The actors provided the majority of the frights, with their intense interactions and well-executed distraction scares. There were even a couple of moments when no one in our party seemed willing to be the one to go through the next room first…which is quite rare for us. The second part of the attraction was definitely the most unnerving. It was a brilliant take on the common blackout maze, but instead of being completely dark there were quick flickers of light so that you could just see enough to find your way through. It was filled to the brim with suspenseful moments and some really great scares especially when someone or something would appear seemingly out of nowhere. The level of fright at RoT is one of the highest this review group has ever experienced and we feel that it is worth the price of admission alone. General admission is priced at $25 and a VIP Fast Pass is just $10 more at $35. The wait was quite lengthy during our late October visit so we were very glad to have opted for the VIP tickets. We recommend visiting earlier in the season or arriving as early as possible to avoid a long wait time, otherwise, the $10 investment for Fast Passes is the way to go and is money well spent. It took our group a total of 22 minutes to complete the attraction, not including the wait in line, which gives us a MPD (minute per dollar) score of .84. We feel this haunt is a very good value for the money spent because the entertainment provided is excellent, the fact that there really isn’t any downtime and it appeared that they made great use of the space available. 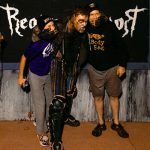 RoT is a “Must See” haunt in our book and we believe it is among the very best attractions in the greater Chicago area. We definitely plan to return next season!